Isambard would like to know a great deal more about this strange man and his mysterious blue box..."
After a couple of major lows for the monthly range, I was a little nervous stepping into this play. Big Finish and historicals usually make for good bedfellows, but the sour taste left by The Lure Of The Nomad especially made me a little wary. Please (I thought to myself, going in), please, not another one like that. The first thing to note is the cover: it’s beautiful. The wider space for the play covers’ imagery is a welcome thing, finally ditching the awkward black bars, and the new logo? It looks superb here, really catching the eye and wowing the viewer. It all makes for a far, far nicer and more consistent ‘Who identity’ and level of design than we’ve had before and I can’t say I’ll be mourning the loss of the old any time soon. A very good move / insistence by whoever is in charge of branding. 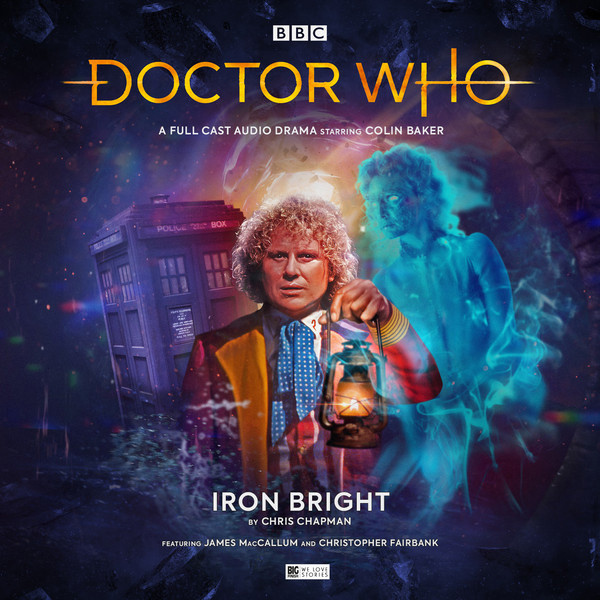 Iron Bright is by Chris Chapman, rapidly becoming a regular contributor to Big Finish’s monthly outings. So far, he’s given us The Memory Bank, a very solid one-episode-long story that I have found myself returning to since the first listen (always a good sign), and The Middle, which I thought had some very strong ideas but perhaps didn’t quite do them justice: very enjoyable overall all the same, mind. Iron Bright probably falls into the same category, but that’s not to slight it. Big Finish were canny when they released the first episode as a free download for newsletter subscribers as it’s a lot of fun: ghosts and history, the Doctor and Isambard Kingdom Brunel, and Colin Baker giving one of his best performances for a while all make for thirty minutes of drama which whizz by. The second two episodes are not quite as strong though. When people see ‘Sixth Doctor + Historical’, the go-to story is normally The Mark Of The Rani, and this has some similarities in that the historical figures are, at times, sidelined in favour of alien goings-on. I feel, though, that this story shares most of its DNA with Timelash. Remember how H.G. Wells is treated less as a figure of historical importance and more as a substitute companion, and historical period settings are largely ditched in favour of alien landscapes? That’s how Brunel is treated here, and indeed how the middle of this story feels a lot of the time. When we return to Earth, I felt the story picked up a bit and I perhaps wish we’d been given a straight historical, or one with greater earthly grounding. I don’t feel the Doctor’s meeting with Brunel is wasted, in the same way his meeting with George Stephenson in Rani is not, and perhaps it was a silly and false expectation on my part to think we’d be getting something more ghostly and less... well, traditional Doctor Who. After all this, the final episode then arrives and things really kick up a gear in quality again. The pocket emptying scene in particular is wonderful (even if Baker does note in the extras that he’s apparently hiding a key prop from the story’s opening in the process: surely a job for a script editor and not the lead actor? ), and I want to stress again that the story is never bad. Far from it. One thing Iron Bright really has going for it is a truly excellent supporting cast. There is not one flat performance in there; everyone gives a wonderful turn. It’s one of the best ensembles we’ve had, with Catherine Bailey and Imogen Church being particularly impressive, and all credit must go to John Ainsworth for sorting it out. That said, Colin Baker’s remark that Becky Wright should return as a companion made me shake a little: surely no more companions for him? Baker and McGann between them seem to be having a competition to see who can collect the most, like a Gallifreyan game of Pokémon. By the time Iron Bright finished, it had won me round again. This doesn’t wash away the bad taste left by recent plays, but it goes a long way to helping. One thing is utterly apparent, mind: keep an eye on Chris Chapman. I truly believe he is one or two scripts away from writing something utterly superb for Doctor Who and I cannot wait to hear it. The Middle and Iron Bright may not quite hit all the marks, but my word do they show a promise and verve that makes me very, very excited to see his name next to a play again before too long.